Guys this PPDT image is sent to me by one of my Friend Shailedra Rajput, he was following me since one month and was preparing for his SSB Interivew . He writes really well and i appreciate his work. I have uploaded a series of PPDT sample Images with Story for Practice you can refer to my previous stories for better Practice. 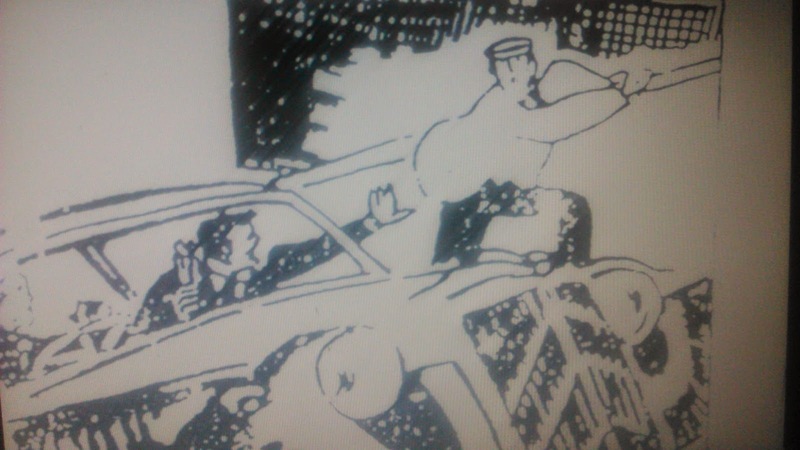 This image consist of a car scene with a thief(a robbery scene), read how to make a positive story on such Images. Mohit is an army officer, he went out for a movie with his friends during the liberty granted to him, after coming out of the theater while he was about to sit in his car ,he heard someone an old lady shouting thief thief running, he saw the thief running by passing his car, he along with his friend chased the thief through a distance but the thief could not make it long and finally got over him handed him to the police and returned the baggage to the old lady, and told the lady to be careful next time,he and his friends was praised by his training officer. 34 comments to ''Sample PPDT/TAT story on Robbery scene: A Negative Image"
Akshay is a manager in a MNC.While he came back from his office he saw a man trying to climb the boundary wall of his mansion.Akshay screams at him why is he doing so and try to stop him.The Man told him that he saw smoke coming out of your windows and he could not able to go through the main gate as there were dogs barking at him.Akshay immediately understands the situation and informs the fire brigade. In few minutes fire department arrives and take control of the situation before it get worse.Helping nature of this man and quick response of Akshay prevents an accident. Gaurav.. Rahul resembles you.. As an officer he must have sense of responsibility.. It's a negative story..
Shyam lived in a small town and worked in small company.one day he and his friend went to marriage party.when he was returning from party he saw one old lady was shouting thief thief and running behind the thief.he n his friend started chasing him .thief tried to jump the wall but before this they got him n hand over to police.Atlast they returned bag to old lady.she was so happy after getting bag n bless them. लूट and it is happen in front of peoples and also we says like that its forcefully incident but robbery has not seems in picture theme. it seems that thief stole precious things so he done this activity in hidden way. Hemant was a second year engineering student residing in gurgaon. While returning back from tution class along with his friend in night, he noticed a man trying to climb a boundary wall. Seeing, he shouted towards the man and immediately rushed towards the man along his friend. The man insisted that it was his property and he lost the gate keys. Hemant checked his identy card. After knowing, he along man, went to key maker, gets him, opens the gate lock.The man thanks hemant for his help. Mohidin is a young IT engineer, and has recently grabbed job in an IT firm. Being new, he had to undergo a training period of three months. He was held responsible of completing many projects and job, so to complete them all he worked really hard till late nights. One night when he was coming home from his office at around 1 a.m, he spotted a man climbing the walls of his neighbour’s house. He quickly called the neighbour on phone and alerted them. And then he called the police too. By that time his neighbours catch the man trying to break into their house, and since mohidin had already called police. They reached in no time and took the theif, Thus mohidin protected his neighbours and their assets. one day umar returning from his school,he saw a man is shadowing in the window of his house and he is trying to enter in the house.umar is a clever and confident boy he understand the situation and immediately call the police.The police come and catch the thief and Umar has appreciated for his cleaverness. Akash is an engineer he along with his friend has gone to the market . there he saw that a man snatched a chain from an old lady so he along with his friends follow that thief they caught them after a long chase . Theif told to that Akash that he is hungry from past 2 days , so he did this he is not a thief . akash first took a chain from thief and handed over to the lady ,then he took him to nearby dhaba and offered food after he had his food . Akash told him he is a healthy guy he should do some work instead of stealing . theif along with akash went to police station and acepted his mistake . Now after 2 years of imprisonment he is working at tea stall and do hardwork . Ram on the way to his office he saw a person running on the road and able jump off the wall. A girl screaming thief thief. Almost board meeting time is on run-out. Irrespective of his busy schedule although he took risk to catch the thief and at-last got over him to nearby police station and handed over the valuable bag to the lady. ram was sitting in his car with his driver and was ready to depart. he saws a old man of nearly 50 years who was physically handicapped. the man was walking through the road by grabbing the wall .so ram calls him by his hand . the man looks at him surprisingly. he comes out of his car and helps the man walk through the road by supporting him. praneeth is working in top mnc company as an project manager. when he was relocated at different city. when he take a ride in cab all of suddenly he saw one of his best friend passing on road side ways. praneeth told drive to stop car and took his best friend to restaurant and having discussion about their life and exprience. spending a good time with his friend and praneeth told about his purpose on coming to this city. he and his friend was happy about thier meet. Rahul is a garment dealer.One day while returning from his work he saw a man holding sack on his back is come out a house by boundary wall.He stopped him but the person started running.Rahul immediatly rise an alarm and call the police helpline number.Till police van came at the location Rahul with the peoples nearby nab the thief and handed over to the police PCR van.The resident of house thanked Rahul for his timely help in nabbing the thief. In a wonderful evening ajith was returning from his tution class, he hears a scream of girl and barking sound behind a huge wall by droping his bag and other materials, he rushed to jump the wall but unfortunately the wall was too large for him. he suddenly turned to the road and stopped a car. and with the help of that passenger he jumped the wall the scene he saw was small girl was attacking by two dogs. he used a stick to send back that dogs and saved the girl. and he admitted the girl in the near by hospital with the help of that car driver. the girl and her family was very thankful to ajith. Rajan is a manager in IBM, while returning for his home the rain stared and he saw his neighbor who is having the grain in a paper bag is in haste to reach the home earliest so he decided to take the shortcut, so rajan offered him lift he took the lift and reached home sooner neighbor thanked him and offered him lunch at home. mohit and pawar were childhood friends both were working in the same firm. one day on weekends they decided to go for watching movie so while driving to the theatre they found a person holding a bag and running along with his car. on the other side they saw few people running behid him calling theif theif, pawar sat next to the door so he gave his hand to caught him but the burglar got escaped and jumped to the other side of the wall, at the same time pawar informed to the police and told them where he headed towards to and police reached there on time and caught the burglar with cash and put him into the prison. Vikram, newly posted DCP in the area was coming late after completing all the pending works from his office with his brother,when he saw in the midst of darkness a man coming out of the balcony with some valuables. He tried to stop the man, but the man ran away, after which he was followed by Vikram with his brother. Later on he was caught and was asked the reason for such instinct, to which the man replied he was robbing the valuable to sell them and use for treatment of his ill mother. Thereafter, he was made realized by Vikram that this would be a shameful act for he would show these qualities of his mother. Then, Vikram returned the valuables to the house-owner and with the man he went to help out his mother and also directed ways to join Police officer so that he won't face such situation next time.